getcalc.com's two fractions average calculator is an online basic math function tool to find the halfway, mean or average of two fractions with same or different (equal or unlike) denominators. By using this calculator, formula & step by step calculation, elementary or grade school students may efficiently solve or practice the worksheet problems or homework for average or fraction between two fractions numbers. Similarly, teachers or parents also use this calculator & associated information to create worksheet, homework or practice problems to find the halfway between two fractions. How to Find the Average of Two Fractions? User may refer the below example workout with step by step calculation to find average between two fractional numbers. Find the average of 1/7 and 1/6. step 2 Find the sum of 1/7 & 1/6 by using LCM (least common multiple) method for fractions with unlike or different denominators. Thus, 13/84 is the average of 1/7 and 1/6. 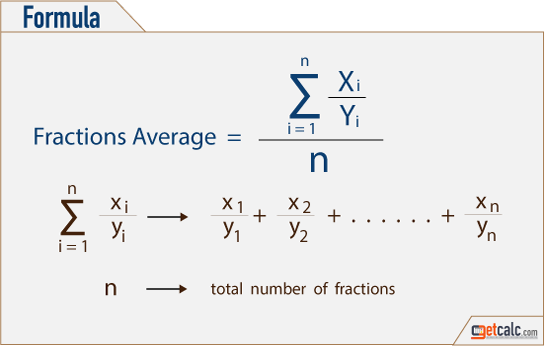 Fractions Average is one of a basic arithmetic operations used in mathematics to find the mean, central value or average between two or more fractions. It can be found by finding the sum of fractions which are having same or different denominators, divided by the total count of fractions. LCM (least common multiple) or LCD (least common denominator) method is used to find the sum of fractions with unlike or different denominators.